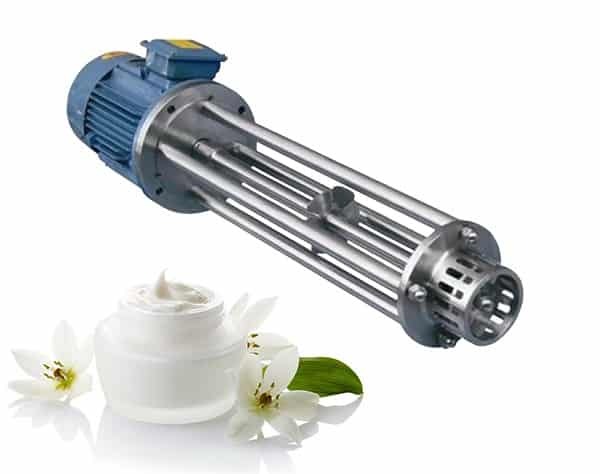 Homogenizer emulsifier, High shear mixer disperses one phase or ingredient (liquid, solid, gas) into a main continuous phase (liquid), with which it would normally be immiscible. A rotor together with a stator is used either in a tank containing the solution to be mixed, or in a pipe through which the solution passes, to create shear. The products could be widely applied in cosmetics, food, beverage, chemical, pharmaceutical, paint& ink industry etc. Four types of different stators are suited to different working conditions. 9. Can choose high-shear emulsifier with explosion-proof performance. Cosmetic creams and lotions are used for a variety of purposes such as cleansing and moisturizing. Hydration of thickening and suspending agents and preparation of a stable emulsion are two of the most difficult mixing tasks that are usually encountered when mixing. The high shear mixing action of a ABSTER rotor/stator mixer can achieve these tasks and offers a number of advantages over conventional mixing. ABSTER stator design for claw type coupling structure, material form the host upper and lower suction at the same time to shear material from all dimensions.